A very important step in your recovery is choosing the right physical therapist. And as with any relationship, it is important that you two are a good match. Know that you’ll probably be working with that person for a few weeks or months, so you have to feel comfortable with them. I have heard a few not so positive stories and even though there are a lot of amazing PTs, not every PT is a good match for every person. 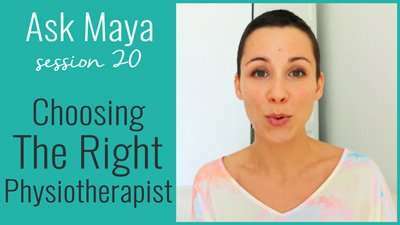 When you’re deciding to work with the therapist, you have to feel comfortable, but more importantly, you have to trust them. Just because someone has an amazing “alphabet” behind their name (see the list of therapist credentials below) that doesn’t mean she/he is the best option for you. This week I’m answering remarkymarkable’s question and I’m guiding you through the process of choosing the right physiotherapist for you and your injury. If you want to discuss how I can help you recover faster and get you back to your normal life as soon as possible, click the button below to schedule a call with me. Do you work with a PT right now? How did you find her/him? Comment below!